I’ve made countless pans of brownies over the years searching searching for a great recipe and tweaking it a bit. The past 2 weeks I’ve really focused on a few characteristics the best brownies in the world should have and made a ton of pans of brownies until they were absolutely perfect. 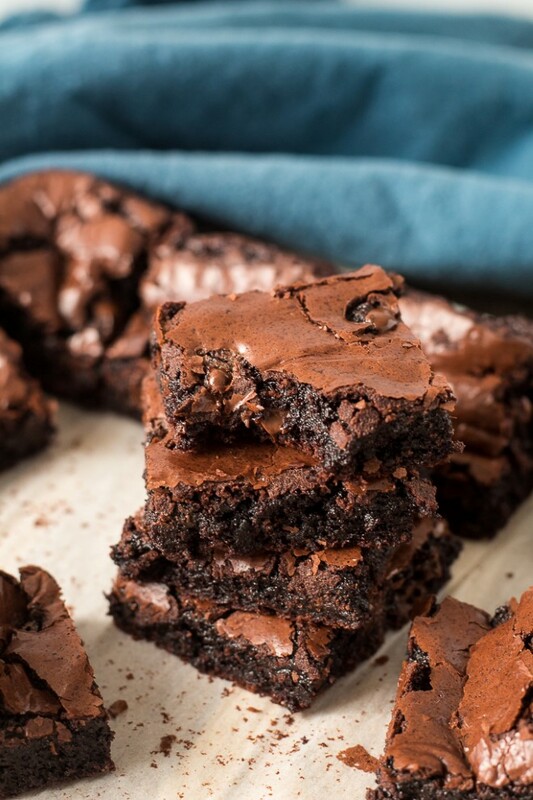 Characteristics of the best homemade brownies in the world! And I think I nailed it. Read on for the ingredients and techniques you should use. They’re actually very easy. All you need is about 10 ingredients and 10 minutes to stir them up. And a little patience while you wait for them to bake. First collect your ingredients. You’ll need butter, bittersweet baking chocolate, white sugar, vanilla extract, eggs (room temperature), cocoa powder, all-purpose flour, baking powder, salt and chocolate chips or nuts (if desired). Start by melting your butter and chocolate. You can do it in a skillet on the stove, but the easiest way is to microwave it for 15 seconds at a time, whisking until melted. Once it’s melted whisk in the sugar. Then, you’ll want to make sure the mixture is almost room temperature before you add the eggs, you don’t want to scramble them. Once the butter mixture has cooled to room temperature, add the eggs and vanilla. And beat well. 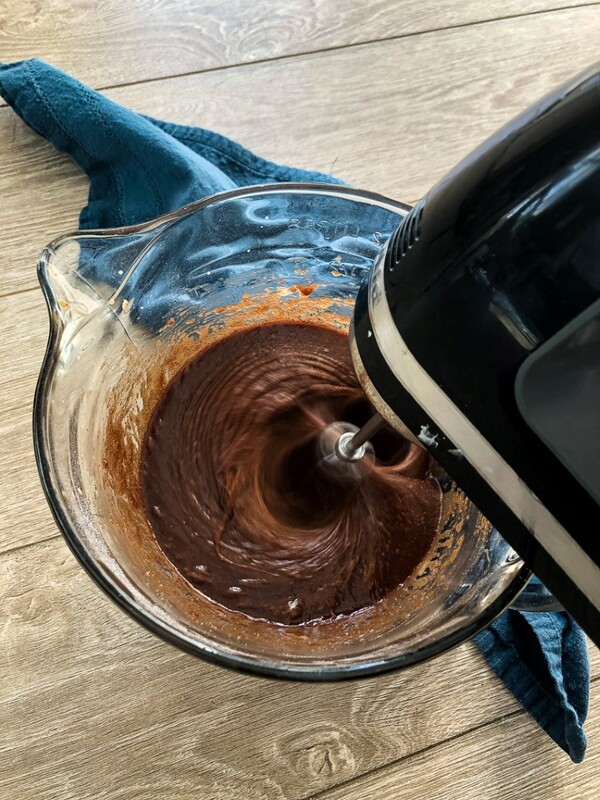 I like to use a hand mixer, but you can use a sturdy whisk and some elbow grease. This is important to get the crackly crust on top of your brownies. 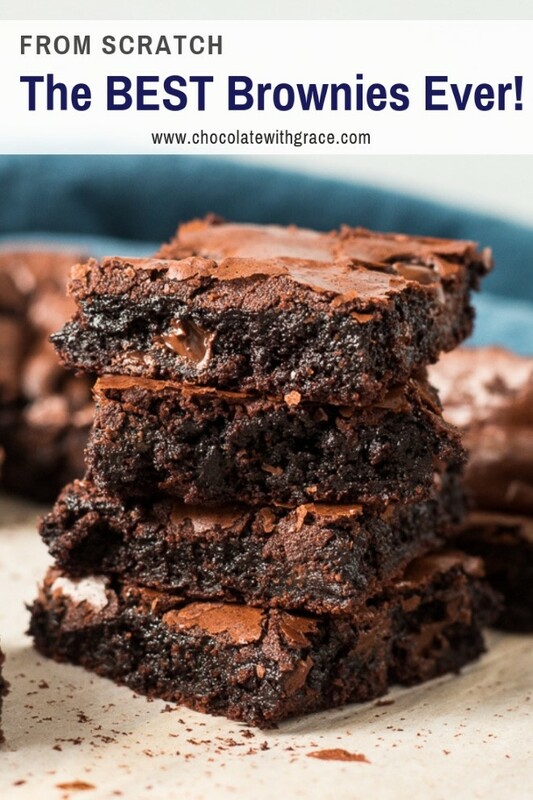 How to get the crackly crust on top of brownies? 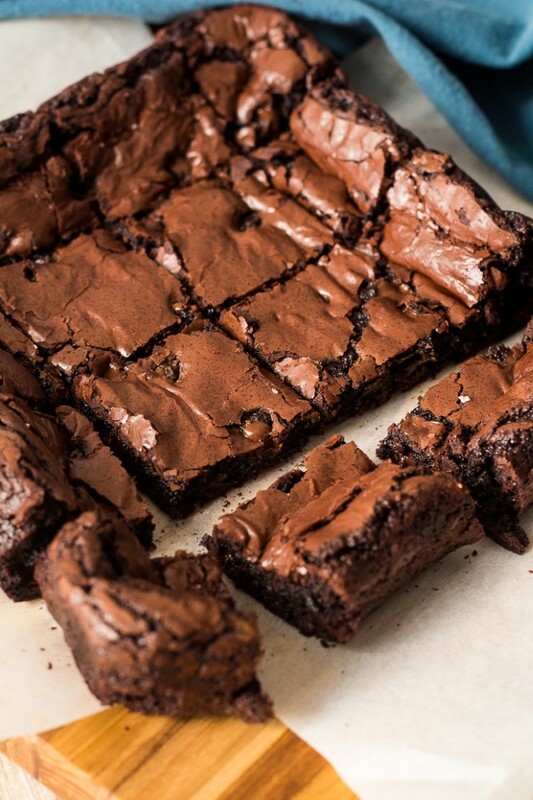 The crackly crust on brownies is formed by beating the eggs in well. Beating the eggs turns them into a slight meringue that makes a crust on top when the brownies are baked. I like to beat the eggs into my brownies with a hand mixer on high for 1-2 minutes. What kind of cocoa powder is best for brownies? After beating in the eggs and vanilla, you’ll add the dry ingredients to the batter: flour, cocoa, salt and baking powder. I find that dutch process cocoa is best for getting that rich, chocolatey flavor like the box mixes. It’s less acidic and has a deeper chocolate flavor. The color is darker and closer to what you expect from a box mix. Hershey’s Special Dark Cocoa Powder (affiliate link) is the dutch cocoa powder I like and use and is widely available. 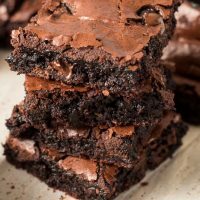 Can I use regular cocoa instead of dutch process in brownies? I’ve made this recipe with regular cocoa powder a lot of times and the brownies turn out great too. They will end up lighter in color and with a slightly different chocolate taste, but will still be amazing. As you stir in the dry ingredients to the batter, don’t over-stir them. Just stir them in until they are incorporated. Over beating the batter will incorporate more air into the brownies and make them less fudgy. How to tell if brownies are done? I think the hardest part of baking fudgy brownies, is deciding when they are done. Over bake them and they will be dry, and nobody wants that. It’s also hard to tell because they are so dark in color, you can’t see them starting to brown. I bake my brownies in a glass pan lined with parchment paper. If you use a metal pan or even a metal pan with a dark coating, they will cook faster, so keep that in mind. 28 to 30 minutes is about the perfect time to bake them. You’ll know to take them out when the top of the brownies are shiny and starting to crack and the center of the brownies don’t wiggle when you jiggle the pan. You can use the toothpick test on brownies, because by the time the toothpick comes out clean, the brownies are over baked. 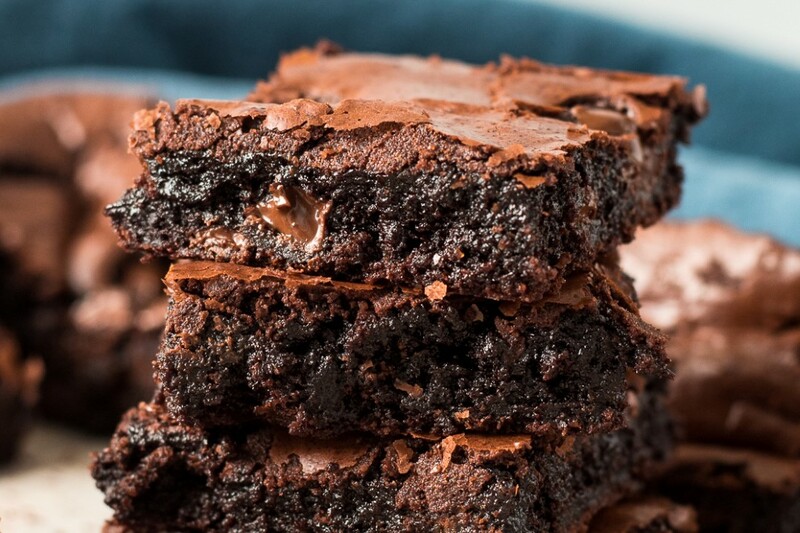 This brownie recipe is fudgy rather than cakey thanks to a high fat to flour ratio. 2/3 cup of butter to 1/2 cup flour and 1/2 cup cocoa. Cocoa acts like flour in brownie recipes and the melted chocolate adds a bit more fat. With almost as much fat as flour in the recipe. You can rest assured these brownies will not be cakey. If you’re looking for a cakey brownie recipe, this one is not for you. 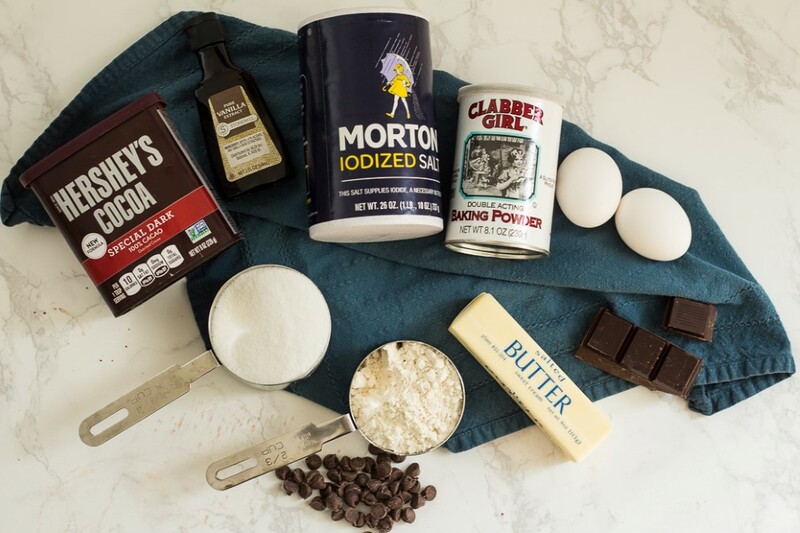 If you want a brownie guide on the roles each of the ingredients in a brownie recipe plays, check out this brownie primer by Food52. It give an excellent overview of the basic chemistry of brownies. How to store brownies to keep them soft? Brownies will keep on the counter for about 2 days in a tightly sealed container (like a tupperware). If you want to keep them longer than that, place then in a tupperware container with wax paper between the the layers and freeze them. They will keep in the freezer for several weeks. But I like my brownies warm best, so I like to serve them immediately. The two biggest culprits of dry brownies are over baking them and measuring the flour wrong. I test and write my recipes using spoon and leveled flour. To correctly measure flour, spoon it into the cup, and level off with the straight side of a butter knife. Scooping the flour out of the container with the measuring cup, packs it into the cup and the result is too much flour added to the brownies, making them dry. The other reason is over baking the brownies. You can see my section above on how to tell when they are done, but you only want to bake them until the center is just set, crackly and doesn’t wiggle when you jiggle the pan. If you end up with dry brownies, your oven temperature might be running hot, check with a second thermometer. These brownies are extra delicious with nuts. My family has really liked walnuts added to theirs, but pecans are great too. They add a nice contrast to the richness of the brownie. For you chocolate purists out there, stick to high quality chocolate chips. I also like to experiment with different flavors of brownies. Right now some of the most popular on my blog are Mint Chocolate Brownies, Cookie Dough Brownies, Pumpkin Cheesecake Brownies and Nutella Brownies. I’m thinking a peanut butter cup version would be great, or a cookies in cream version with Oreos. 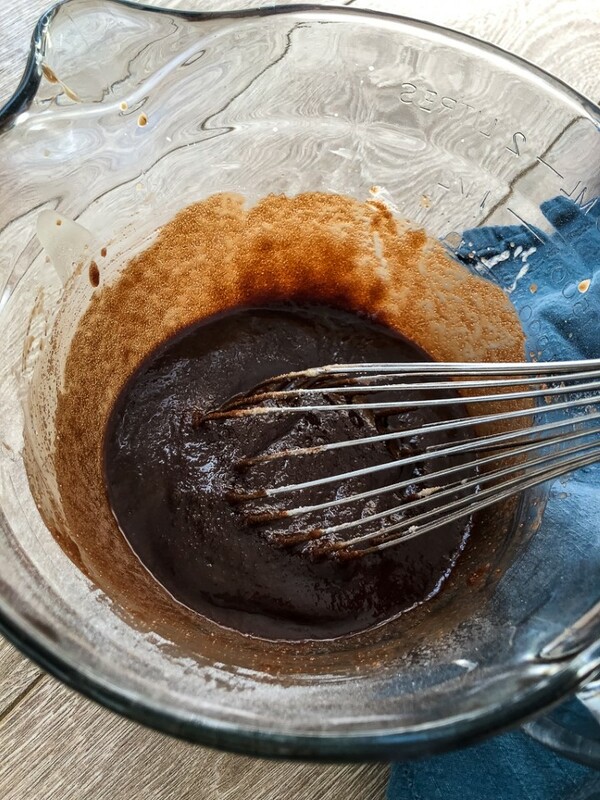 Feel free to add chopped peanut butter cups or Oreos to this brownie batter for a fun twist. 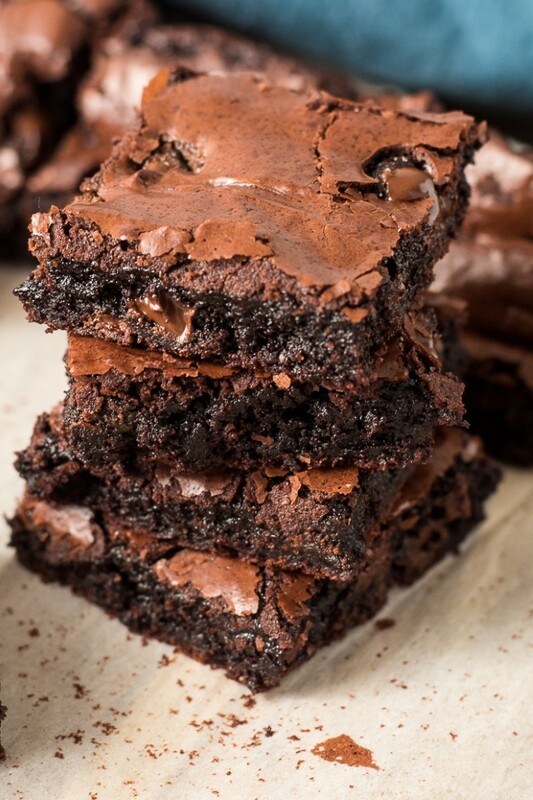 Let me know if you make these brownies and what you think. Tag me #chocolatewithgrace on Instagram and be sure to follow me there. Preheat the oven to 350° and line an 8 x 8 inch glass pan with parchment paper. Melt the butter and baking chocolate together in a microwave safe bowl. Microwave in 15 second intervals, whisking between each interval. When melted whisk in the sugar. Let the mixture cool until almost room temperature. You don't want to scramble the eggs. Add the eggs and vanilla and beat with a hand mixer on high for 2-3 minutes or until lightened in color and fluffy. Beating the eggs well is what gives the brownies that characteristic crackly top. Add the cocoa powder, flour, baking powder and salt. Stirring just until incorporated. Last, fold in the chocolate chips or nuts if desired. (I like to save some nuts or chocolate chips to sprinkle on top of the batter in the pan for looks.) Spread the batter into the prepared pan. Bake at 350° F for 28-32 minutes or until the tops of the brownies are shiny and crackly and the center doesn't wiggle when you shake the pan. Remove from the oven and let cool for at least 20 minutes. When ready to serve, use the parchment paper to lift the brownies out of the pan before cutting. Serve warm or cooled completely. The brownies will store tightly covered on the counter for 1-2 days or in the freezer for a couple weeks. *the eggs should be at room temperature to keep them from chilling the butter back into a solid when you add them to the batter. **Dutch process cocoa powder will give a more box like flavor and darker color. However, regular cocoa powder may be substituted with great results. ***This recipe may be doubled to fit a 9 x 13 inch baking pan. SO. DANG. GOOD. Thank you! WOW!! 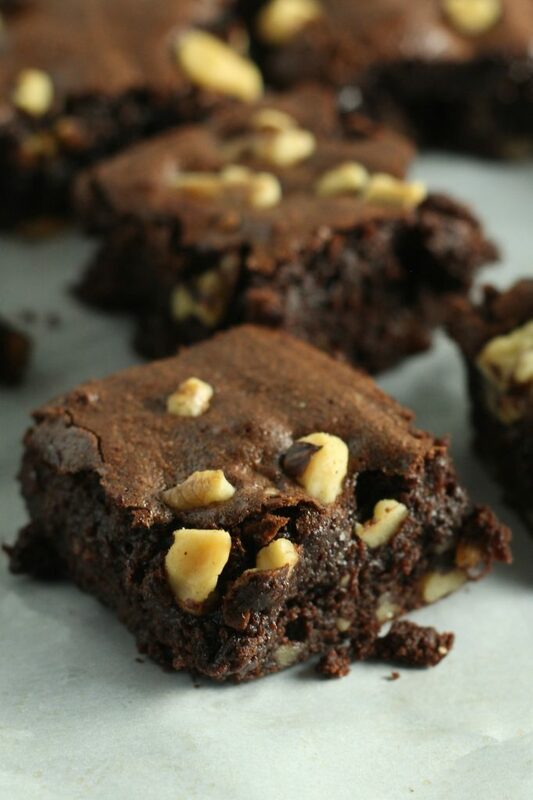 These brownies are incredible! I can’t wait to make them for my kids! These are seriously so fudgy and perfect! I’m the biggest brownie critic around but I have to say that these are amazing. I haven’t had brownies in so long! These look absolutely perfect and just the motivation I need to make a batch. Thanks!